Comments: Broadleaf evergreen mallee (multi-stemmed shrub) native to Western Australia. Leaves are gray-green concolorous (top and bottom the same color), opposite (or nearly so) and lanceolate, the bark is tan to gray, smooth and sheds in flakes, the gumnuts are in 3's, axillary, and on a 25mm long flattened peduncle. 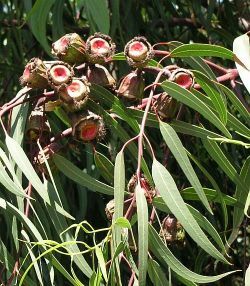 The gumnuts are exceptionally large--25mm wide by 30mm long, somewhat bell shaped and have a red disk of an unusual shape (looks a bit like an enlarged red blood cell). the Calyptra scar is uneven and appears to have 4 dried out regions that look a bit like teeth. Calyptra (flower cap) is scarlet red, and flower is bright yellow. This species was identified by Dan Sekella.